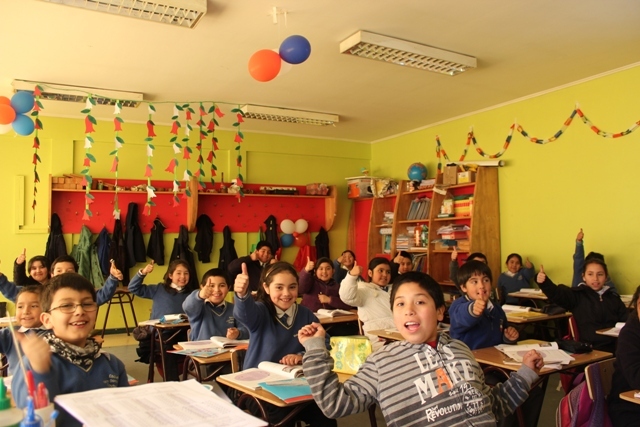 Saskia has recently started the volunteering element of her time in Chile and has written a really insightful piece on what day one in the classroom in Chile is really like. Check it out below. If you want to follow her experience in Chile make sure you have a read of her first blog all about the first few days in Chile. “During my time in Chile, I will be spending my weeks acting as a volunteer English teacher in a school close to where I am living. Being able to get to know the kids I’m teaching and having the responsibility of helping them was one of the reasons I chose this project as it makes the experience unique and fun to get involved in. Before arriving, I was warned about how excited the children would be to see me, but I didn’t realise quite the extent to which this was true. As soon as I got inside the classroom I was surrounded by about 25 seven year olds, all trying to hold my hand, hug me and touch my hair! Having only ever known the English student-teacher relationship, I soon discovered that the Chilean one is very different. Admittedly this difference is probably emphasised by the age of the children I am teaching, but small things such as the fact that they refer to the adults as “Tia”, translating to Auntie, show how a lot of the younger children really look up to them. Since I arrived on a Monday, the day began with a whole school assembly; the amount of national pride that the teachers and students have was immediately obvious as they heartily sang the Chilean national anthem (surrounded by Chilean flags, balloons, and plenty of red, white and blue bunting). I was then called up onto the stage and asked to introduce myself through the microphone, before being asked various questions – such as how old I am and how I was feeling – by two very sweet 7 year olds. Luckily I don’t mind public speaking! The staff were also all very welcoming, which helped me quickly settle in despite my hair colour meaning I stick out like a sore thumb! I was offered a variety of homemade biscuits, shortbread and fruit whilst everyone came and said hello to me, enjoying the opportunity to practise their English. If reading this has sparked your interest in Chile or getting involved in volunteer teaching then why not check out our website.